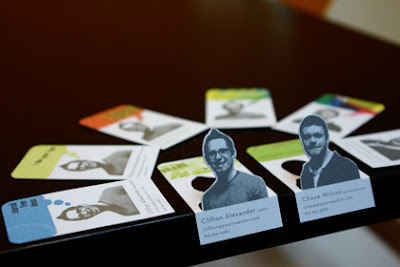 The Reactor design studio has come up with a series of personalized pop-up business cards. The base of the card consistently contains all of the information, while the colours and sayings of the upper half change from card to card. For a Guess Who? kind of corporate world. Does your person have a beard? Does your person wear glasses? Flip. Flip. Flip. guess who? was a great game - i completely forgot about it until you just mentioned it.